The Wounded Warrior Regiment would not be denied. 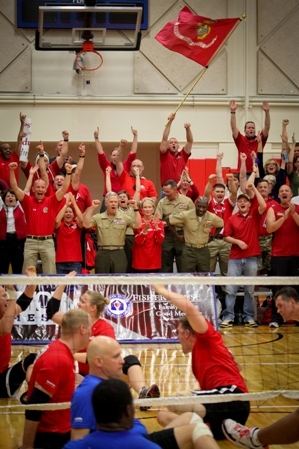 Competing Wednesday in the Warrior Games in Colorado Springs, Colo., the All-Marine team swept the All-Air Force team in sitting volleyball. It already had dispatched the Army team a day earlier in the paralympic-style games, which are open to wounded, ill or injured service members. If you’ve been reading Battle Rattle this week, you already know that Commandant Gen. Jim Amos and his wife, Bonnie, attended the event did the wave. After watching the volleyball matches, Amos and Kent reportedly caught the final round of an archery event. Amos presented a gold medal to Sgt. Daniel Govier, and a bronze medal to Sgt. Stephen Lunt. Not surprisingly, the All-Marine shooting team also exceled at the Warrior Games, as this news story points out. Well, that’s what Marines do! Kick you-know-what!